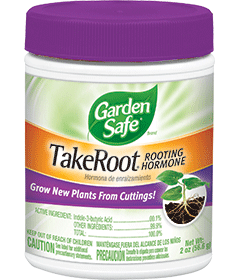 Use Garden Safe® Brand TakeRoot® Rooting Hormone to grow cuttings from your favorite plants, including African violets, roses, poinsettias, philodendrons, geraniums, coleus, woody ornamentals and most other popular home, garden and greenhouse varieties. STOP Read Entire Label Before Use. The cut ends of the cuttings should be slightly moistened before treatment. Stir cut ends in Garden Safe Brand TakeRoot Rooting Hormone powder. Remove excess powder by tapping on rim of container. Plant treated cuttings in a rooting medium such as potting soil. Mist regularly. STORAGE: Store in a cool, dry place. Keep in original container. CONTAINER DISPOSAL: Nonrefillable container. Do not reuse or refill this container. Offer for recycling, if available. CAUTION. Causes moderate eye irritation. Wear protective eyewear (goggles, face shield or safety glasses). Harmful if inhaled or absorbed through the skin. Avoid contact with eyes, skin or clothing. Avoid breathing dust. Wash thoroughly with soap and water after handling. Remove contaminated clothing and wash before reuse. For Terrestrial Uses: Do not apply directly to water, to areas where surface water is present or intertidal areas below the mean high water mark. Do not contaminate water by cleaning of equipment or disposal of equipment wash waters or rinsates. If person is not breathing, call 911 or an ambulance, then give artificial respiration, preferably mouth-to-mouth, if possible. Call a Poison Control Center or doctor for treatment advice. Have the product container or label with you when calling a Poison Control Center or doctor, or going for treatment. You may also call 1-800-257-3379 for emergency medical treatment information.